We had some mighty fine Millionaire's Bacon from our Sunday breakfast at Bacon in Novato. The owner’s wife teased us with the details of how the bacon had been baked for four hours with sugar and salt. I took this information as a challenge. 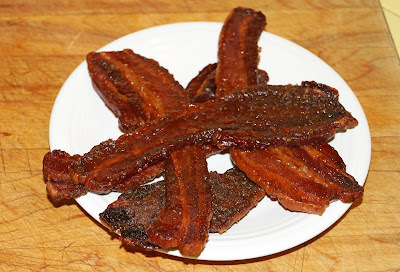 Maybe we can do Millionaire's bacon bigger and better. Hence, my creation of Billionaire's bacon was created. The process could not be simpler. The only secret is to use the best ingredients possible. We had some fantabulous slab bacon from Chico Meat Locker procured on our last Meat Adventure. 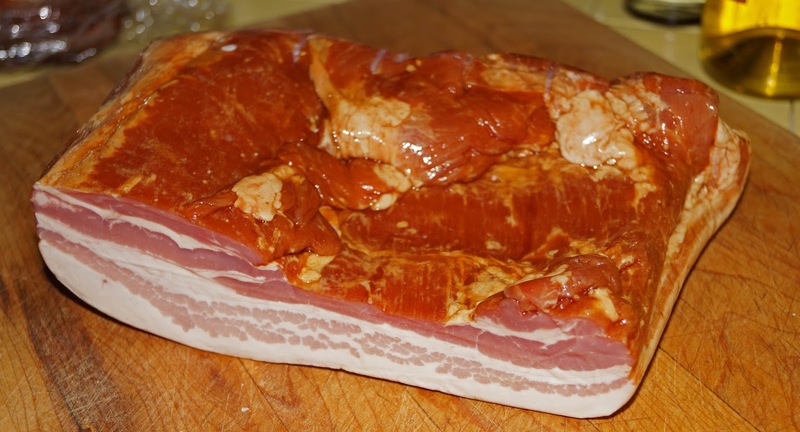 It is hard to imagine that we could improve on this mighty fine specimen of cured belly. We sliced the slab into fairly thick slices. I wanted them to hold up to the baking process. We then drizzled each rasher with a little maple syrup. Pure maple syrup, the real deal would moisten and be the glue to hold down a packing of brown sugar. This was placed on a cooling rack over a foil lined baking pan. Ms. Goofy would of killed me if I had not used the foil for easy cleanup. This syrup and brown sugar was only put on one side. It was then baked for 25 minutes in a 350 degree oven. We then turned the bacon over and applied the sugar and syrup coating to the second side. Another 25 minutes and the Billionaires Bacon was done. The house smelled scrumptious while our bacon was transforming in the oven. The bacon was removed from the oven and set to cool. It was difficult to wait until our creation was ready. Wow!!!! Salty, sweet with a hint of maple is a combination that is addicting. So easy and so satisfying was the word. Millionaires bacon was great but ours with the addition of maple syrup was worth a billion more. This takes pig candy to a whole new level. 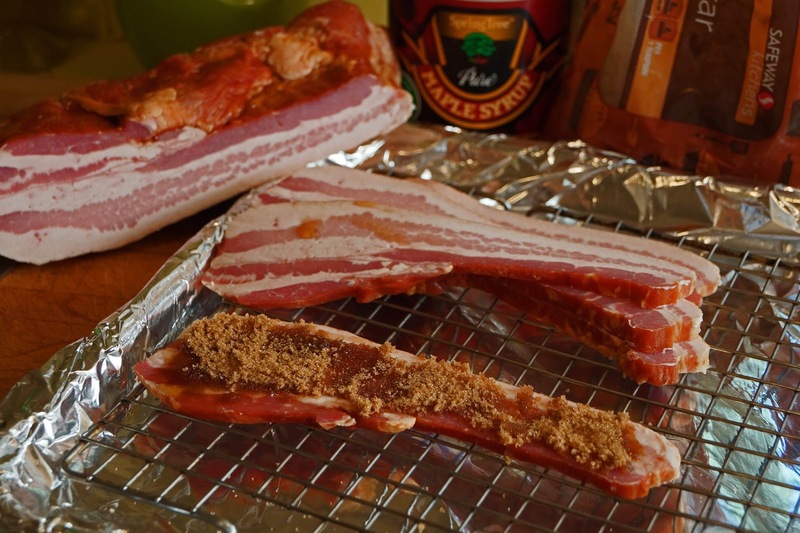 Going to try this in the smoker for sure. Thanks for the tip Chilebrown! Three Dogs BBQ, I look forward to your post.